The 30-day guitar challenge culminates on World Guitar Day 2018, a massive 24-hour online celebration of the guitar on 29 September. 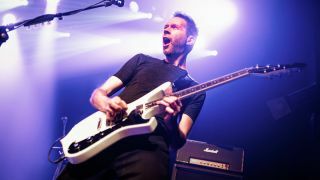 30-day guitar challenge: Paul Gilbert co-founded Mr. Big in 1988 with Billy Sheehan, ex of David Lee Roth’s band. Gilbert was previously shredding alongside Bruce Bouillet in Racer X, but Mr. Big allowed him to focus more on songwriting with tracks like Green Tinted Sixties Mind and the acoustic anthem To Be With You. From 1989 to 1996, Mr. Big released four studio albums and enjoyed worldwide success. As is often the case with intense touring schedules, tensions built up and Paul left in 1996 to pursue his solo career and reconvene with his mates in Racer X.
Mr. Big continued with Richie Kotzen on guitar, recording two albums, Get Over It and Actual Size, but disbanded in 2002. However, a reunion tour with Paul back on guitar led to two more albums: What If… in 2011 and The Stories We Could Tell in 2014. Paul’s style is astounding to witness; he is capable of blistering picked runs played with precision and power, but also a lot of attitude. Example 1 highlights his trademark, three-notes-per-string patterns, here applied to the E Minor Pentatonic scale, rather than the more typical seven-note scale shapes. The Minor Pentatonic contains a mixture of tones and b3rd stretches, which can be quite a challenge even for average-sized hands. Example 2 is ‘tinted’ slightly ‘green’ and features a melodic and super-catchy two-handed tapping lick played along one string; a great example of using tapping musically. Our third riff echoes tracks on Mr. Big’s latest album, The Stories We Could Tell. The riff is played in a 16th-note shuffle feel and features open powerchords on the lower strings. To spice things up there are some blistering scales within the riffs; something at which Paul is exceedingly brilliant. Example 4 looks back to the early days with a riff using various positions of E Minor Pentatonic, performed with palm-muted alternate picking and two-handed tapping.Our final riff has a more laid-back feel and demonstrates that alternate picking doesn’t always have to be full throttle, but is equally cool for more relaxed situations. Our solo nods towards tracks like Colorado Bulldog and American Beauty. It starts in blues-rock style before moving onto a string-skipped arpeggio passage and finishes up with some trademark Gilbert alternate picked sextuplets. Work through all the examples slowly, making sure the notes sound clean and full before speeding up – gradually. For some of the examples a metronome, plenty of picks and a lot of patience will be required. This lick uses the E Minor Pentatonic scale (E-G-A-B-D) and is arranged in a three-notes-per-string fashion. Keep your thumb near the centre of the back of the neck to allow your fingers to spread out more easily. Play the first three notes legato, then the next using up, down and up strokes. Continue the pattern throughout. This lick is played entirely on the first string using two-handed tapping to create melodies within the key of E major (E-F#-G#-A-B-C#-D#). Focus on keeping the fretting-hand notes and the tapped notes at the same volume and keep all the notes the same length. This riff is played in a 16th-note shuffle feel, which is best achieved by making your downstroke strums twice the length as the upstrokes. The descending lick is played ‘six notes per beat’ with alternate picking; keep the heel of your picking hand in contact with the bass strings to prevent them from ringing out. This riff moves through various positions of E Minor Pentatonic (E-G-A-B-D). Keep your picking hand loose by moving from the wrist and using the weight of your hand to create momentum. Use alternate picking throughout and make sure that each string change begins with a downstroke. This riff is played with a crunchy clean tone, so turn down the volume on your guitar to lessen the gain. Palm-mute the strings near the bridge to aid note separation and keep your pick moving down and up continuously. Move from the wrist but keep the string-to-string pick movement as small as possible. The solo starts with some classic rock bends and double-stops, then shifts the same idea an octave up. The following four bars are based around an E minor triad (E-G-B) played with the root on the 14th fret, third string and the remaining notes arranged in a string skipping shape using hammer-ons and pull-offs. For the scale run in the final four bars, start with a downstroke and use strong alternate picking to the end.